Chesil Beach features in my earliest memory of Weymouth. Some time in the early 1980s my parents brought us here and I recall scrambling up and and down the pebbles of this massive stony bank. The beach popped up a few years later in my geography classes at school. It’s a unique curiosity and a wonderful feature on a coastline that’s already packed with variety and interest. 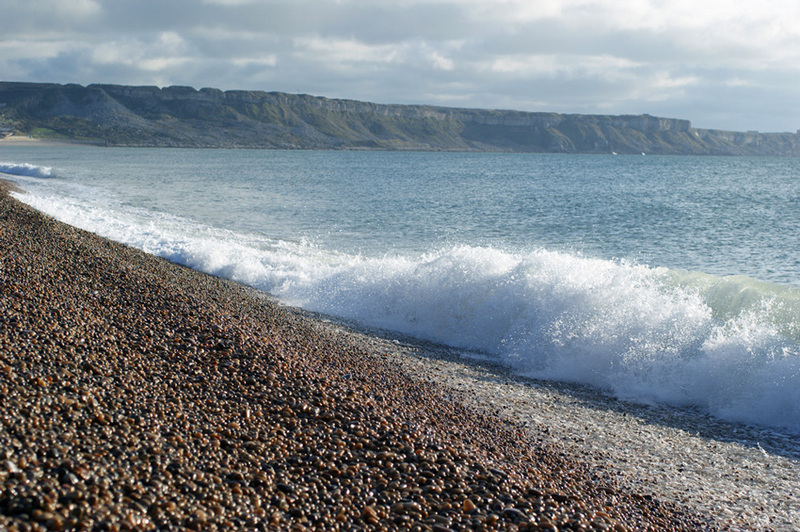 So what’s so special about Chesil Beach? Or Chesil Bank, as it’s also known. 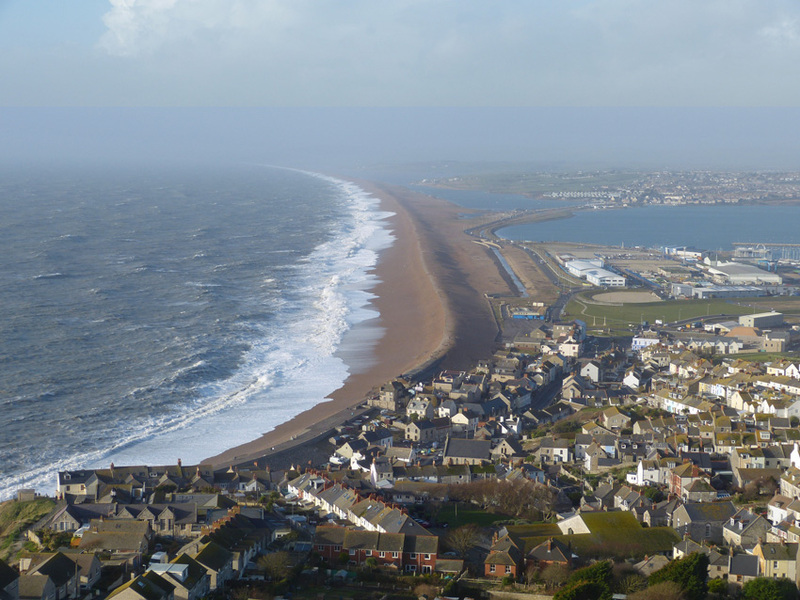 Chesil Beach is a massive shingle bank, stretching 18 miles from West Bay to the Isle of Portland. For much of its length the beach is separated from the mainland by the Fleet, a natural lagoon of brackish water. No one is quite sure how the beach came into being, but it’s recognised as being a special environment, and as such is subject to special protections. You’re not allowed to walk in the central section between 1 May and 31 August, to protect birds nesting in the pebbles. The Fleet is a nature reserve. A feature of the beach is that wave action sorts the pebbles by size, with the larger stones being at the Portland end. Over the centuries the waves that batter Chesil has snared many a passing ship, with the debris also being washed to the Portland end. Here, at Chesil Cove (or the more descriptive Dead Man’s Cove), it’s still possible to encounter the mortal remains of some unfortunate victim of the sea. A couple of years back, in later winter, I came across the carcass of a sheep, half buried in the piles of wood and rubbish swept in by stormy tides. Climbing Chesil is hard work but worth it, for the exhileration of cresting the top, with its huge reveal of the open sea beyond. The best place for this is at the Chesil beach centre between Weymouth and Portland. There’s a huge car park (sorry, payment is required) and the beach centre can provide welcome refreshment along with lots of information. Be prepared for the hard work of walking on the pebbles, which combined with what can a steep slope can present something of a challenge. Rest for a while at the top, or on the seaward side, and enjoy the distinctive whoosh and roar of waves on the pebbles. Unless it’s really quiet day, when the sea barely bothers to lap at the stones. In the big winter storms of early 2014 the waves came right over the beach at this point. I’ve climbed to the top when big rollers are coming in and it’s a scary experience – and that’s was when the waves were breaking way below me. Always respect the sea and keep your distance from the big waves. You’ll find it easier to access the beach from the Portland end. There’s limited (and free) car parking in Chiswell, right behind the beach, near the Cove House Inn. From here’s its a short walk to the cove that marks the eastern end, were the flotsam and jetsam collects. On a clear day you can see for miles along the beach. 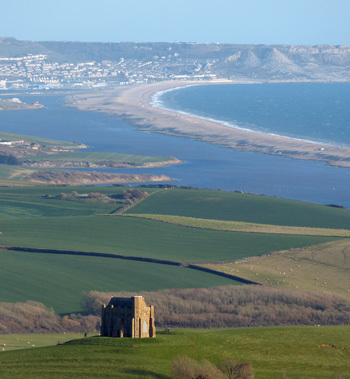 You can enjoy Chesil from a safe distance from many points along the coast. Two viewpoints I often visit are the New Ground car park on Portland (near the Portland Heights Hotel) and on the Weymouth to Bridport road (the B3157), as it climbs the hill out of Abbotsbury towards Burton Bradstock. 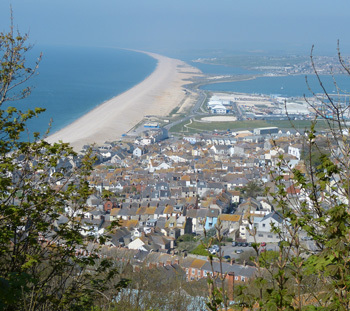 From New Ground on Portland you look out over the length of the beach from Chesil Cove to West Bay. Parking is free at New Ground, making it a great place to pause and enjoy the views. The Abbotsbury view, on the B3157, reverses the direction, letting you look along the length of the beach and the Fleet towards Portland. As the road climbs steeply out of Abbotsbury you’ll find a number of small parking bays on either side of the road, where you can pause to absorb the marvellous perspectives. If you do visit Chesil Beach, enjoy the pebble but don’t take any home with you. Helping yourself to half a dozen stones might not seem much, considering that Chesil is estimated to be made from 180 billion pebbles. But the beach is now being eroded, rather than built up by the sea. While it may not change visibly in our lifetimes, it is getting smaller. So please enjoy, but leave Chesil Beach as you found it. 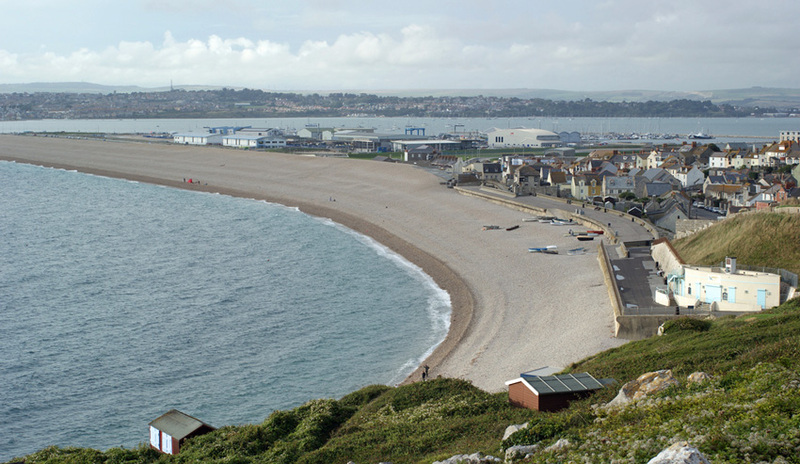 Click here to learn more about Chesil Beach.